In a stunning and strategic move, Deere & Company has signed a definitive agreement to acquire the Wirtgen Group. 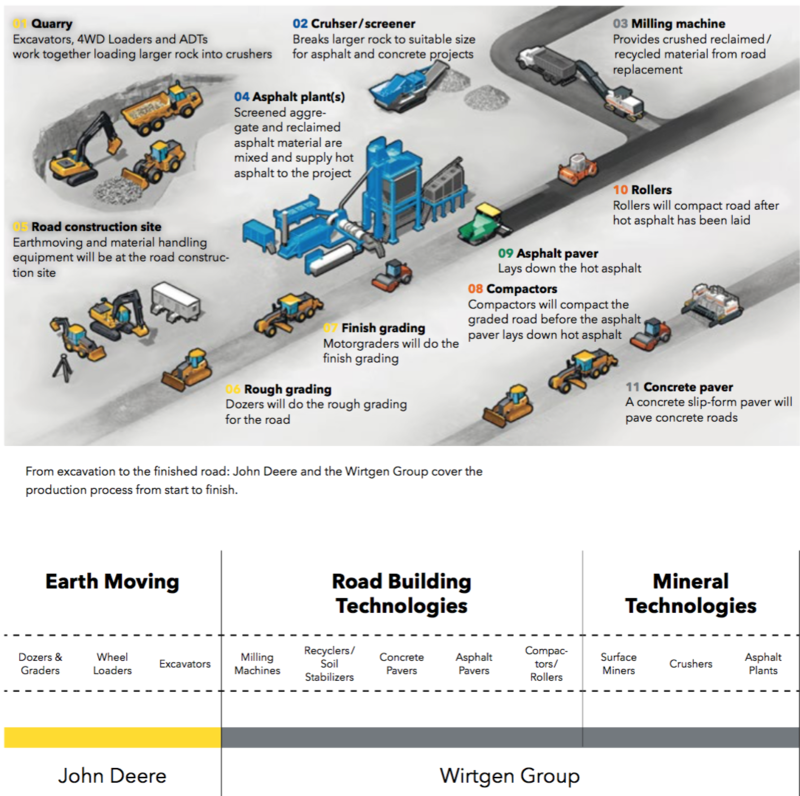 Above: This Deere-supplied graphic illustrates how Deere and Wirtgen products are complementary in the road construction process. The move gives Deere a worldwide presence in road construction equipment, along with a host of products (asphalt and concrete pavers, rollers, milling machines, crushers, and asphalt plants) it has never offered before. In addition, it presumably opens up a European dealer network for Deere's yellow iron. Outside of Russia, Deere Construction & Forestry has little presence in Europe. The purchase price for the equity is EUR 4.357 billion in an all-cash transaction. The total transaction value is approximately EUR 4.6 billion (USD 5.2 billion based on current exchange rates), including the assumption of net debt and other consideration. The Wirtgen Group had sales of EUR 2.6 billion in the year ending December 31, 2016. Deere expects the transaction to be accretive to earnings per share and currently expects to fund the acquisition from a combination of cash and new equipment operations debt financing. More details on the transaction can be downloaded here. The Wirtgen Group has a global footprint with approximately 8,000 employees and sells products in more than 100 countries through a large network of company-owned and independent dealers. "The acquisition of the Wirtgen Group aligns with our long-term strategy to expand in both of John Deere's global growth businesses of agriculture and construction," said Samuel R. Allen, Deere & Company chairman and CEO. "Wirtgen's superb reputation, strong customer relationships and demonstrated financial performance are attractive as we expand the reach of John Deere construction equipment to more customers, markets, and geographies." Max Guinn, president of Deere's Worldwide Construction & Forestry Division, said, "This transaction enhances our global distribution options in construction equipment and enhances our capabilities in emerging markets. Spending on road construction and transportation projects has grown at a faster rate than the overall construction industry and tends to be less cyclical. There is recognition globally that infrastructure improvements must be a priority and roads and highways are among the most critical in need of repair and replacement." Deere plans to maintain the Wirtgen Group's existing brands (Wirtgen, Hamm, Vogele, Kleemann, Benninghoven), management, manufacturing footprint, employees, and distribution network. The combined business is expected to benefit from sharing best practices in distribution, customer support, manufacturing and technology as well as in scale and efficiency of operations, Deere says.